Addictions are everywhere these days. Even seemingly innocuous behaviours can become addicting if left unchecked. For example, some people are addicted to sugar, to their smart phones and devices, to social media, etc. But recruiting? Come on, I must be joking, right? Organizational addictions may be even harder to spot than personal addictions because, by definition, organizational addictions are cultural norms. When “everybody’s doing it,” addictions don’t look that bad. That’s precisely what makes the addiction to recruiting so insidious. Hiring Manager: I need you to find a highly trained, senior specialist for my department. 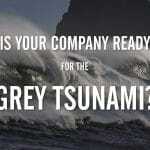 HR Advisor: Which intermediate specialists in your department are prepared to take on greater responsibility? Hiring Manager: Nope, none of my intermediate specialists have the technical skills to step up. HR Advisor: You currently have three senior specialists. Have they been regularly training your intermediate specialists to fast-track their development? Hiring Manager: The intermediate specialists come to them when they have questions, but the senior specialists are too busy right now. I can’t afford to pull them off real work to train others. HR Advisor: You’re never going to believe this, but our recruiter just told me that she convinced a senior specialist from one of our competitors to consider taking a position with us! Hiring Manager: No thanks. That competitor uses a totally different process than we do. It would take him a year just to unlearn our competitor’s process before he’d be useful to me. HR Advisor: Perhaps we should begin focusing our recruiting on hiring junior specialists and training them so we will have intermediate and senior specialists in the future who are trained in our unique process? Hiring Manager: The senior specialists are too busy right now. I can’t afford to pull them off real work to train others. Many organizations today are totally unaware that they are caught in a desperate and detrimental cycle. They are addicted to what is considered to be “the quick fix” of recruiting. Virtually every time they have a vacancy, they are forced to look outside the company to find top talent because they don’t have qualified employees who can step up. Why? Because they don’t effectively develop their people. When good people within the organization repeatedly get passed over for promotion by external candidates, they become bitter and either a) mentally check out, or b) look elsewhere to advance their career. When the company needs to hire qualified senior people, what do they do? Because they don’t effectively develop their own people, the only option available to them is to once again hire someone from outside the organization and perpetuate the cycle. These organizations are, in a very real sense, addicted to recruiting. Creates a bottleneck to organizational growth. Low employee engagement when employees repeatedly get passed over for promotion in favor of external hires. Higher turnover occurs when these disenfranchised employees leave to advance their career elsewhere. Low productivity ensues, resulting from lack of effective training and development and lack of employee engagement. Institutional knowledge is lost as people retire. Higher recruiting costs as the salary of external hires is 20% more on average than salaries of existing employees. Like all addictions, repeating the behaviour both reduces options as well as obscures the remaining options available. 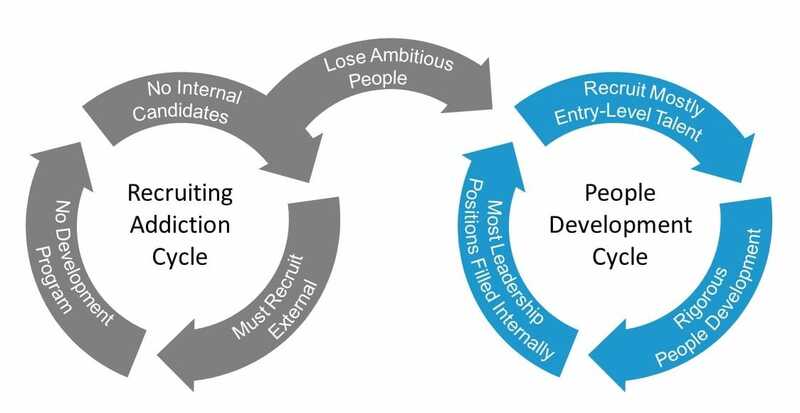 Like the gambler who feels he needs to keep gambling to make up for previous losses, organizations often feel that, because they don’t have any internal candidates, the only option available to them is focus more energy on recruiting! The reality is that there is an alternative to the costly addiction to recruiting. The key to successfully recovering from recruiting addiction is to believe and understand that there is an alternative. Some of the key findings from the research for my book Succession Planning That Works is that world class organizations a) put their people first, b) have a people strategy, and c) this strategy revolves around developing their people. 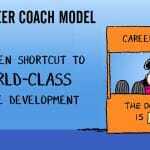 World-class organizations focus their recruiting on entry-level positions and have a disciplined process to develop their people up through the organization. And, this is key, their people-development process is not run by HR. The executive team itself owns the responsibility for people development throughout the organization. HR may help support the process, but the process is led by the entire executive team, or a subset of the executive team known as the People Committee. Establishing a people-development process takes time and effort, but it is so worth it. Imagine if, when a senior position needed to be filled, the hiring manager had several qualified candidates to chose from among their own internal team of employees. 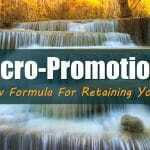 Imagine if promotion criteria were consistent across the whole organization. Imagine that these promotion criteria focused on soft skills such as taking accountability for results and requesting and acting on feedback. This is how things work in world class organizations. 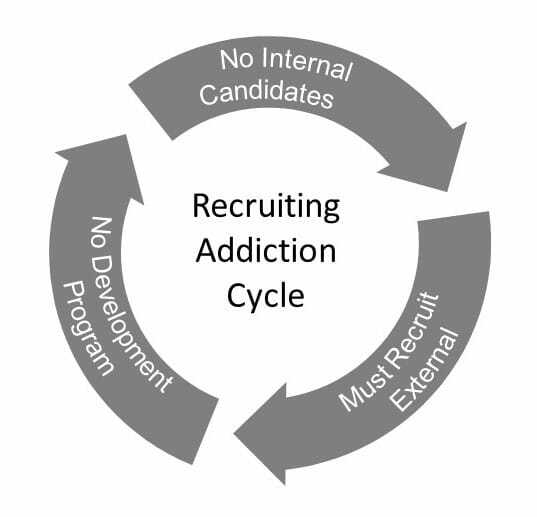 If you’ve read this article and you would like some advice on how to help your organization recover from it’s recruiting addiction, I am offering a FREE 30 Minute Recruiting Addiction Recovery Consultation Call to anyone who requests one. Just email me at mtimms@availleadership.com with the subject heading: FREE 30 Minute Recruiting Addiction Recovery Consultation. Thanks Kevin! Glad you enjoyed it.